The Jets have chosen their next head coach, former Cardinals defensive coordinator Todd Bowles. He may or may not be the right man for the job, but he's sure as hell got the right name for it. 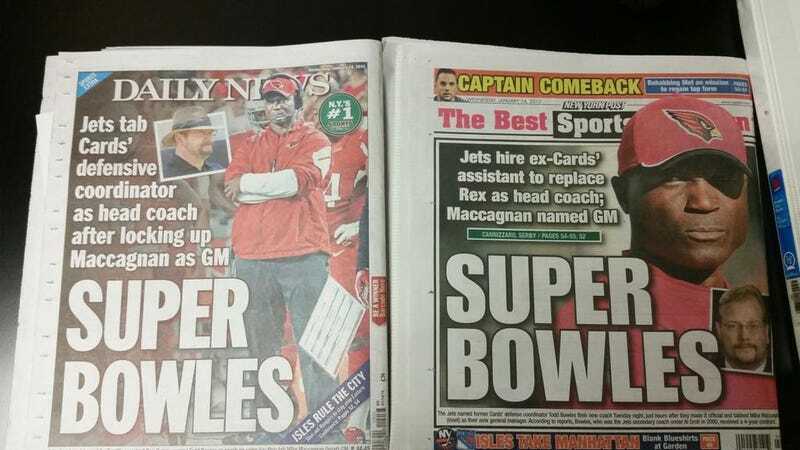 The hire comes on the heels of Mike Maccagnan being named the Jets' new GM, and Bowles will reportedly seek to bring in Chan Gailey, last seen taking the Bills to three straight last-place finishes, to run the offense. Still, it's nice to see a first-time head coach in a league that seems to thrive on retreads. And it figure to be a great time for back pages.